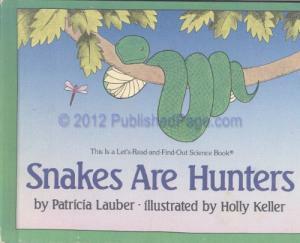 This was an enjoyable exploration of the behaviors of a few different snake species. I was a little surprised the text didn't make a bigger deal out of the fact that rattlesnakes are venomous and therefore dangerous, but my kids did seem to appreciate that it didn't portray snakes as inherently scary. Sign into Goodreads to see if any of your friends have read Snakes Are Hunters.